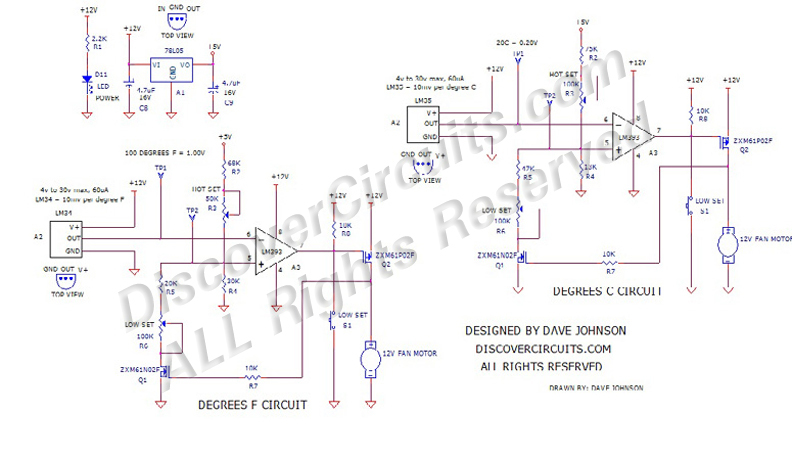 This circuit will turn on a 12v DC powered cooling fan when the air temperature reaches a certain high temperature and will keep the fan turned on until the temperature drops below a second lower level. Both the high and low temperatures are both adjustable. For ease of use, the temperatures are proportional to either degree F or degrees C, using an accurate electronic sensor. A LM34 is used for those wishing to measure the temperature in degrees F. A LM35 is used for those wishing to measure the temperature in degrees C. The output of the LM34 is scaled for 10mv per degree F so 100 degrees will produce a voltage of 1.00v. The output of the LM35 is scaled for 10mv per degree C so 20 degree C will produce a voltage of 0.2v. This voltage can be measured at test point #1. At test point #2, both the high and low switch points can be measured and adjusted. By pressing the small pushbutton switch S1, while measuring the test point 2, the circuit’s low switch point can be adjusted. Be sure to adjust the high temperature first, then the lower one, since the first temperature setting will affect the second. One half of a LM393 dual voltage comparator is used to decide when to turn on the fan motor. A p-channel MOSFET Q2 routes power to the fan when the voltage comparator changes state. Q1 switches in a second resistor network to change the temperature set point when the comparator A3 changes state and turns on the fan motor.